Bagel is what I go for when my day is busy, and I have no time to make breakfast. I make my bagel with cinnamon and raisins, and of course a little of that good stuff called butter. Past days I’ve been busy working on the technical side of my blog and it was a challenge. However, I’m glad that now my home (blog) is faster and browsing my recipes will be a better and more pleasant experience for you. Back to our recipe of the day. 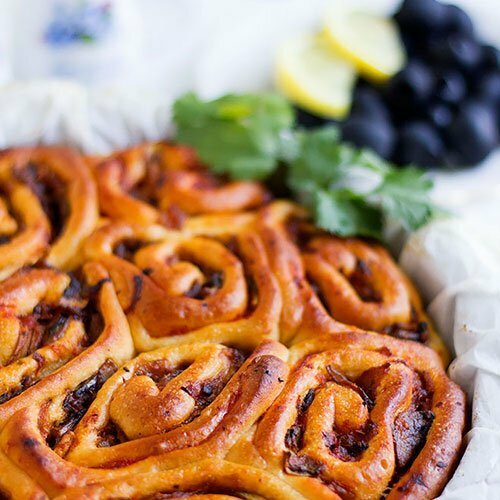 I believe that home-baked goods are fresher and taste better all the time, so I mostly bake our bread and pastries. 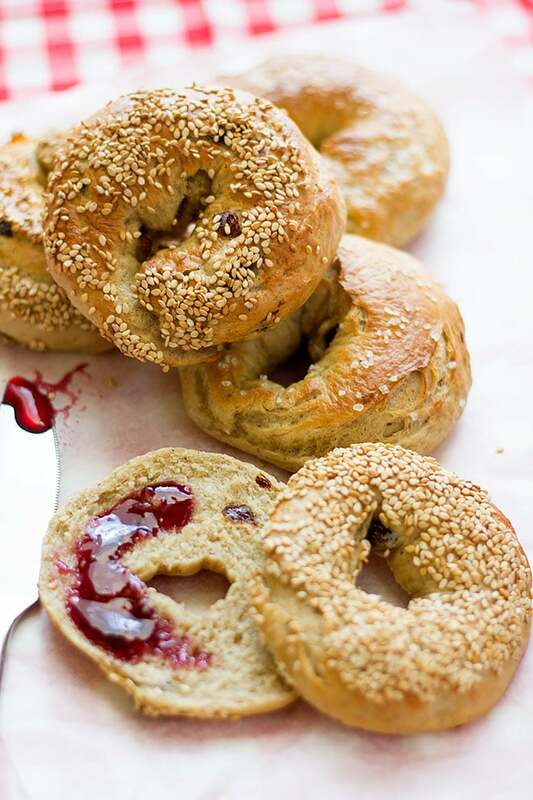 I know it’s easy to pick a bag of bagel from the store but the homemade version will always win. Let me not forget to remind of my Turkish Simit (Turkish Bagel.) if you are interested in trying another interesting version. 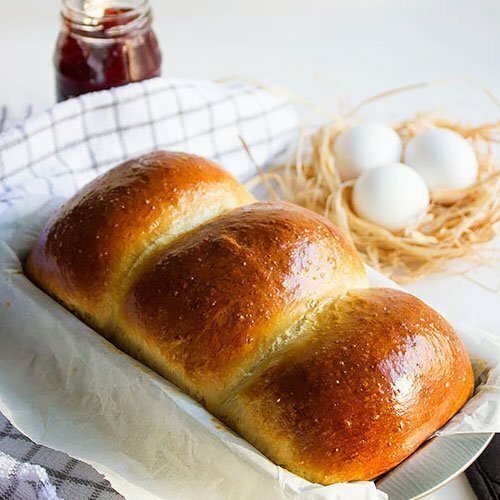 In this homemade recipe, I have used all-purpose flour but feel free to use half all-purpose and half whole wheat flour. 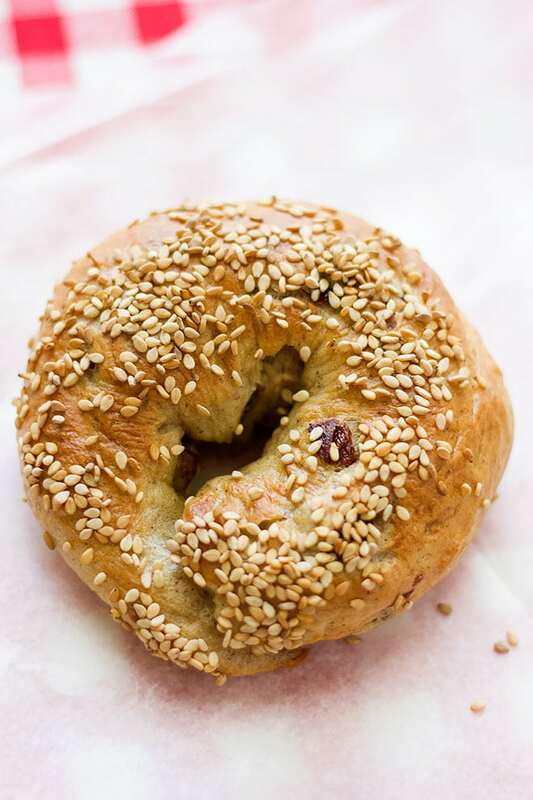 There are no eggs in this version and a small amount of oil is used to help the bagel stay moist longer. Bagel dough is a forgiving dough; you won’t mess up this recipe I promise! I know that some bagel recipes ask for molasses, but here I used honey instead. Making bagel is as simple as adding all the ingredients in a bowl and kneading it for eight whole minutes. Yes, the kneading part may take time since you need to develop gluten for a softer bagel, you can use a stand mixer for this step, although, kneading a bagel dough, in my opinion, is therapeutic. The labor you put in kneading plus the aroma of the cinnamon will give you a pleasant feeling. To make the bagel look good, you can go creative with the toppings. 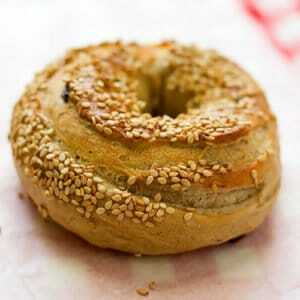 Sesame seeds and coarse sugar will look great on a bagel. I didn’t brush the bagel with eggs, after boiling the bagel for 1 minute on each side, I placed it on the sesame seed and the seeds stuck on it perfectly. 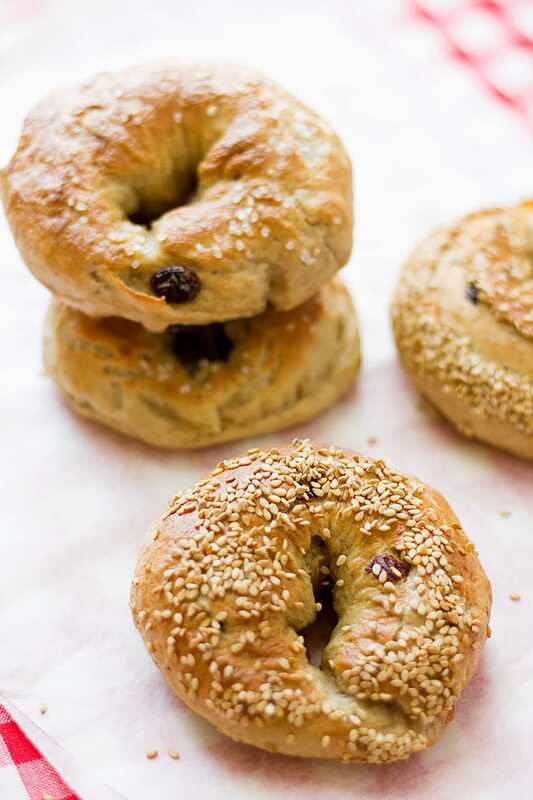 If you have flour, oil, salt, water, yeast, cinnamon, raisins, sugar, honey, and some love for a homemade bagel, waste no time and make some today, the bagel if stored in an airtight container will stay fresh for few days. You can freeze the bagel up to two months. Let’s make some bagel; I promise it will be fun! No eggs were used in this bagel recipe. 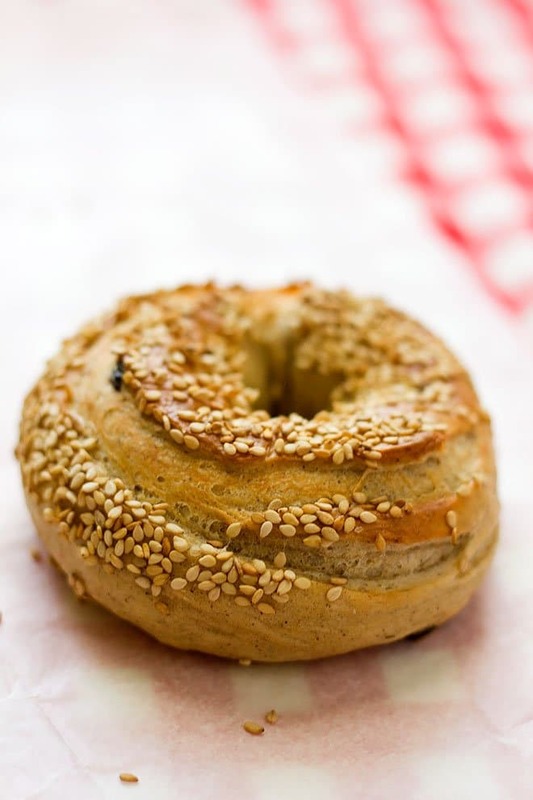 Homemade and delicious bagel, perfect for breakfast and easy to make. Mix the water with yeast and sugar, cover and keep aside for 10 minutes to make sure that the yeast is active. In a bowl, add the flour, salt, oil, cinnamon powder, and mix well. Add the yeast mixture to the dry ingredients gradually and knead until the dough is not sticking anymore, that will take around five minutes. Add the raisins to the dough and knead for three minutes. Cover the dough with wet kitchen towel and allow the dough to rise for at least 2 hours. Punch the dough to deflate it. Knead the dough for one minute. Cut the dough into five equal balls. Using both your hands, roll the balls into a 7-inch-long log. Press the ends of the log together to form a circle. Cover the circles with a wet kitchen towel and let it rise again for 15 minutes. In a deep pan, add 8 cups of water and three tablespoons of honey. When it comes to a boil add the bagel and cook for one minute on each side. Do not crowd the pan with the bagel. 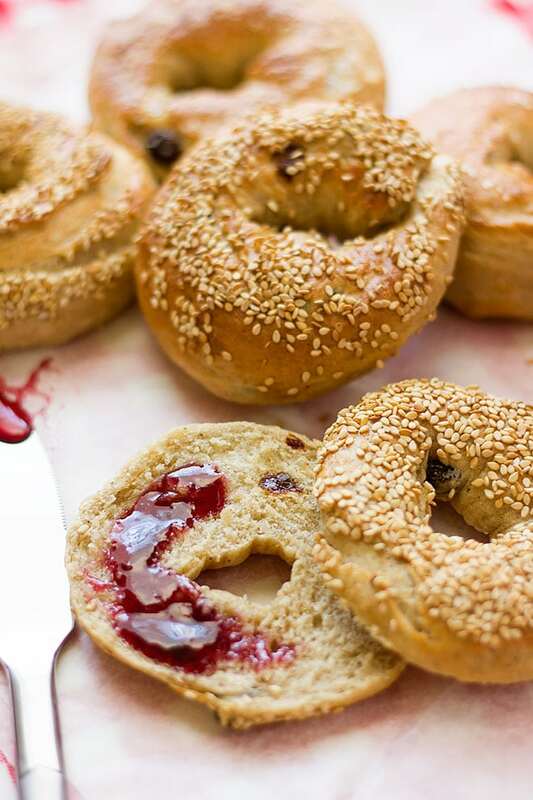 Place the bagel on sesame seeds, coarse sugar, or any of your favorite toppings then place on previously prepared baking pan. Bake on the middle shelf of the oven for 15 minutes. They look great with sesame seeds and raisins, Muna. What beautiful and enticing photographs you have, I love the clean fresh appearance of your blog. Now to bagels, I too make all of our own bread and bake most days, yet, I still have not tried bagels. This recipe looks really easy to follow so I’ve pinned it and will attempt them. Thanks for sharing. Thanks for your kind words 🙂 … Please let me know how you liked my recipe. I made these bagels today and I am pleased at how easy they are to make. Thanks for the recipe. I’m glad that you’ve enjoyed it!